Last year, I strolled through the TL in Downtown San Francisco in search of Brenda's French Soul Food. It was part sketchy and a whole lot of "why am I here" stared me in the face (literally) as I navigated the mean streets. 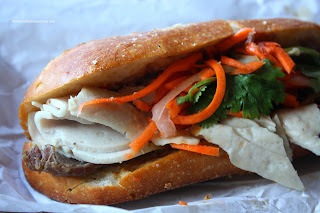 This time around, it was for Banh Mi or the Vietnamese Sub. Kim joined me on my little adventure and I guess it feels more comfortable with numbers. Besides, he's experienced a lot worse areas and only proceeded to mock my lack of resolve. No matter, I tend to go anywhere for food, even if personal safety is compromised. In reality, it wasn't scary at all, other than the minefield known as doggy doo. What's with dog crap and sidewalks here??? Anyways, we finally made it to Saigon Sandwich. Located amongst the other Vietnamese establishments on Larkin, it is both non-descript and got dive written all over it (amongst other writing on the awning). As expected, there was already a lineup. Doing like what the Romans do, we queued up. 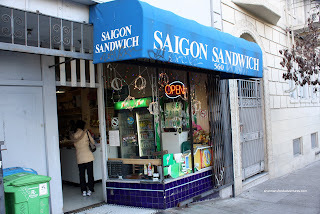 The 2 ladies behind the counter were pumping out sandwiches like there was no tomorrow. We ended up getting one each of the Special and Roasted Pork. 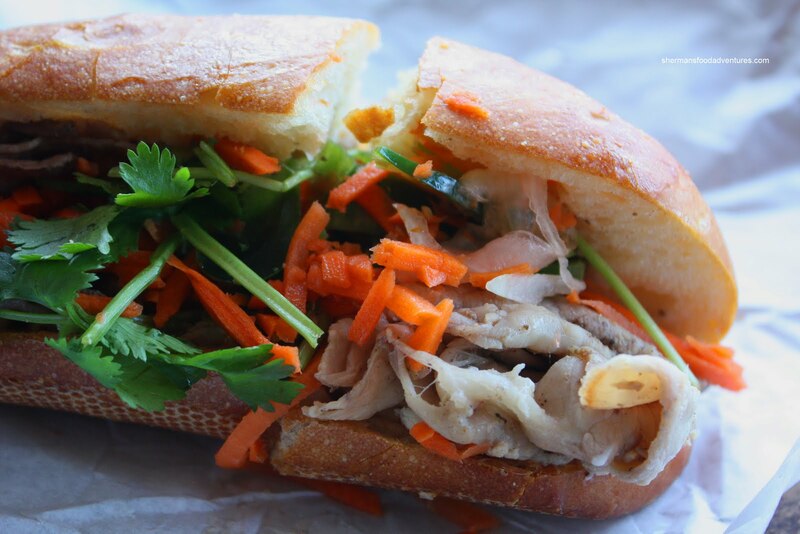 Unlike the Banh Mi that we get in Vancouver, the French roll here is quite a bit denser and has a thick crust. It's quite the chew! Personally, I would prefer a lighter crunchier bread; but this one was okay as well. Despite the abundance of meat, the density of the bread overshadowed everything. The flavours were a bit lost as a result. With all that being said, I did not dislike the sandwiches. They were definitely different from what I am used to; but they are good in their own way. Factor in the always reasonable price of Banh Mi and one can see why there is always a lineup here. Strength in numbers? HAHAHA! Good suggestion this one was indeed. One thing you forgot to mention, though: How "uneven" some of the components were, namely, it seems you got all the jalapeño peppers! Hey Kim, yah I was a little vague on the descriptions pertaining to the subs. Probably because the bread was a bit too dominant IMO. I was just not feeling it because of that.